shape, whether new or already in-service. Our history and reputation prove that we can we take linings to the extreme limits of endurance with applications in the most rigorous environments such as: wheeled vehicles, commercial/ specialty vehicles, fire/EMS/ambulance, heavy equipment, vans/Trailers and mass transit. Check out our mobile services for all you construction needs as well as our in shop accessories. Is your Bedliner looking a little old and faded? Has the sun and circumstance of wear and tear taken its toll? Or perhaps your maintenance has fallen a little short? Whatever the cause, We Have The Solution. Endura Gloss is a hand applied, water borne, U.V. stable Top Coat product that can be purchase over the counter or we can apply it for you. Endura Gloss has a ten year track record that keeps new bedliners looking new and restores old bedliners to like-new condition. With Endura Gloss there is no need to keep re-coating your bedliner every two months with traditional vinyl spray-on dressings which only create a slippery surface which actually attracts dust and dirt, to its oily surface. SO WHY WASTE YOUR TIME? Endura Gloss, can be applied right after the bedliner has been installed or years later with the same fantastic benefits. There is no need to mask off the entire truck, no need to use expensive spray equipment and no toxic V.O.C.’s, which means no hassles from the AQMD! Endura Gloss provides a hard, wet and glossy finish that seals and protects the color and luster of your bedliner. 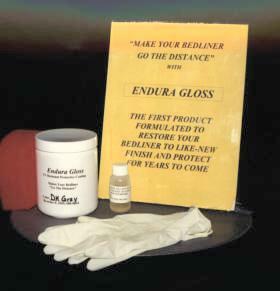 Dealerships can offer Endura Gloss to its customers through their service and parts department. Endura Gloss will even add value to “trades-ins” if applied prior to resale. Want to change the color of your bedliner? Endura Gloss comes in five (5) different colors and can be applied right over a black bedliner.